Resume is the most primary and the first form of communication that takes place between a person who is looking for a job and the company’s employers. The way a person creates his resume speaks tons about how the person is. It is necessary for the resume to have all the accurate information and absolutely no jargon. Since a resume is the first form of communication, it is expected to be impeccable. Most of the employers decide if the candidate is worth hiring by looking at the job resume. Moreover, a resume has almost all of the professional qualifications of a person’s life, along with their hobbies, interests and achievements in the extra-curricular activities. All of these skills, interests hobbies helps the employer in deciding if the candidate is good enough for the firm and if he is, his application is accepted and the individual is called for the second stage of the hiring process. Although, people who have already been in the industry have a strong resume, they have other professional experiences and posts as well. However, a first time job seeker does not have these qualifications. 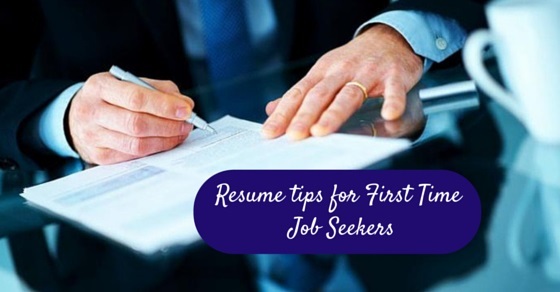 Hence, here are some useful tips for the first time job seekers on how to write your first resume. The following mentioned are few first job tips on how to write a resume for the first job and how to get a first job. If you have just graduated out of college or if you have not graduated and want a first ever job of your life, the first most important thing that you need to keep in mind is that, your resume has to be short and simple. For a first timer, there shall be no ‘worked at’ column in the resume. This technically takes up most of the space in the resume. Hence, if you are a first timer, make sure, your resume for first time job does not exceed more than a page. Employers who get long resumes from candidates who are first timers don’t think twice before hitting the delete button. Hence, make sure that your first ever resume is short, simple and to the point. This will surely help you to get job. It is very important for the candidate to avoid use of jargons and use the common language and font used and accepted by most of the companies and firms. The font size and the color of the font should be basic and the important points highlighted. Resumes with text in italics or any other form of font may cause an inconvenience with the employers as not all the servers may show the layout and font as perceived. The basic fonts such as times new roman or Arial are considered to be the most user friendly fonts that avoid any form of technical error. The use of basic language makes the resume easy to read and understand and lessen the time consumption of the employer. Since you do not have a work history, the best way to begin a resume is to mention your objectives clearly and highlight it. Your objectives will create a good impression in the minds of the employers. This will help in forming your image as focused. The objectives mentioned should have a sense of firmness and they should not exceed a line. One should also avoid writing sentences to explain the objectives. The mention of your objectives will make you a strong candidate in the minds of the employers. The objectives that you mention can range from individual growth to the improvement of the firm. Make sure you do not sound too over empowered or too selfish in the objectives as it is the first line that the employers will read after your basic details. Though you do not have a professional work experience but mention the internships that you have done or the volunteering work. Make a list of all your hobbies and volunteering experiences and mention them briefly in your resume. This shall help the employers understand your abilities and consider you to be a potential client for the firm. Also, make sure you mention your greatest strengths like communication skills, writing skills, etc. moreover, every achievement and ability that you have listed on the resume should relate to the job that you are applying for. More than mentioning your abilities it is also important to make sure that you prove the abilities to the employers with enough references of achievements. Although you do not have any prior work experience, that in no way gives you the liberty of being unprofessional while writing and forwarding your resume. Professionalism is a must in any corporate sector. Make sure your resume is professional by avoiding any typos or grammatical errors. It is also equally important to proof read the resume time and again before forwarding it to the employers as there is nothing worse than a resume with typing errors and wrong spellings. Build a resume which shows competence and enthusiasm to the employers. With this, even with no work experience, you shall get qualified for the next round. With no professional qualifications, the one thing that might get you the job is your skills. If you have extensive knowledge in photo shop or any other computer equipment be sure to mention it and write references for the same in the resume. The skills speak a lot about the person, hence it is important to mention as many skills that you have along with the primary volunteering that one has been active in, to show the employers that you are the perfect candidate for the job. Skills like photoshop, management, marketing and even working for an NGO goes a great way in securing a job for a first timer. One of the most important parts of a resume is the educational qualifications of a person. The skills and abilities of a person can only be taken into serious consideration if the person has a strong educational base. It is mandatory to mention all the major exams that one has cleared along with the grades that have been secured as well as the year and month in which the exam has been cleared and appeared for. In the education section, one can also include awards and honors received for educational endeavors. A person who has a strong educational base is more likely to be accepted in the job even if he is a first timer. You may know a lot of people with a lot of skills and abilities. However, that does not mean that you write the same skills in your resume just to impress the employers. It is very important to give truthful and factually accurate information in the resume. Employers may in the beginning accept that you have the certain set of skills but once you start job or working, they will surely make out that you have not been honest and that will cause you a lot of trouble in the future. Honesty is considered to be the most important virtue that every employer expects from the candidate. The things in which a person is interested in, or the ways in which a person spends quality time speaks volumes about the type of person he is and how well will he be able to manage the work. The interest sections of the resume needs to be honest and yet have all the things that the person is interested in. If a person enjoys playing outdoor sports and has managed to accomplish something in the same, he shall be considered as hard working and hence, create a positive impression in the minds of the employer. The interests of a person form his disciplinary pattern and help the employers to choose the right person or candidate for the job. Although you are a first timer, it is important to show yourself as a very dedicated and directional person in your resume. Use words like organized, executed and developed to express terms and opinions. Being authoritative does not in any way mean bragging about your qualifications and interests. Employers will never let a bragger or a person who thinks too much of himself as it will not only hinder the growth of the company but the other employees too. The resume needs to be strong enough to clearly indicate the strengths of the person without looking too over bearing. Although a resume is the first impression that an employer gets of a candidate in his mind. Though it is necessary to create a strong resume with all the mentioned points above, it is equally important to be honest and forthcoming in front of the employers. Lastly, a resume can or cannot get you the job of your dream, but a good personality and strong ethics will surely take you a long way in life.